How do consumers handle credit card debt? We decided to do an exploratory study to see and were surprised at our preliminary research findings. 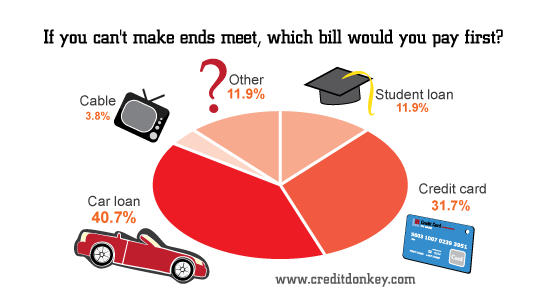 CreditDonkey conducted the survey of 504 adults using multiple-choice questions on common credit card concerns in early July 2012. 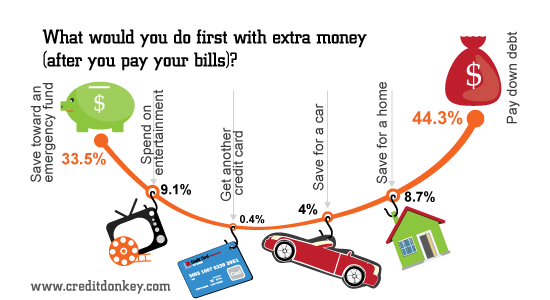 If they could barely make ends meet, most Americans would pay their car loan or credit card bill first. But a surprising few, nearly 4%, would pay their cable bill first. When economists talk about consumer finance, it’s easy to get lost in the weeds. They commonly quote statistics such as revolving consumer credit outstanding, which is mostly made up of credit cards and currently stands at $826.9 billion. Behind such numbers are real, often grim stories. Nearly a third in our survey have gone without medicine because of a lack of funds. More than a quarter, some 27% have gone without food. 1 in 9 respondents has missed a car payment or experienced repossession. 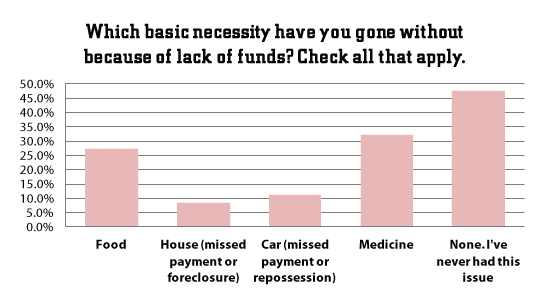 Almost 1 in 11 has missed their house payment or experienced foreclosure. 1 in 20 consumers has carried more than $20,000 in credit card debt at one time. More than 12% have carried over $10,000. On a brighter note, nearly 4 in 10 have always paid their balance in full. 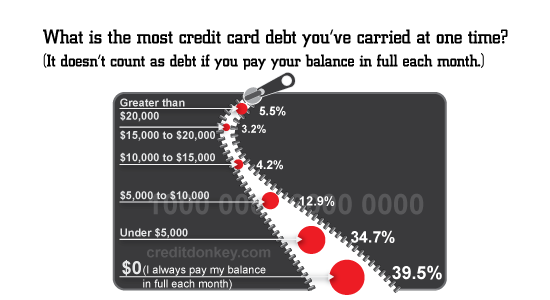 Another third, some 34%, have carried less than $5,000 in credit card debt. Paying just a few extra dollars on your debt can save you money and help you take control of your finances. Read our infographic on the power of the extra dollar for more information. A third of Americans would put their extra money toward an emergency fund. Another 44% would use the funds to pay down debt. Only 9% would spend it on entertainment. When asked, "What would you do first to prevent unpaid bills from being turned over to debt collections?" more than a quarter said they would make partial payments and hope for the best. 68% of respondents rightly indicated that the best course of action is to contact your creditor/lender if you have trouble making a payment. Surprisingly, 2% of respondents would pay the nicest, most lenient creditor LAST. Learn how to get out of debt with our educational 3-step guide. Some 5% are under the misimpression that creditors can contact you before 8 a.m. or after 9 p.m., even after you have made a written request to stop contacting you. In fact, under the Fair Debt Collection Practices Act (FDCPA), once you have made such a request, those creditors can contact you only one more time, to confirm there will be no further contact or to let you know they will be taking legal action against you. 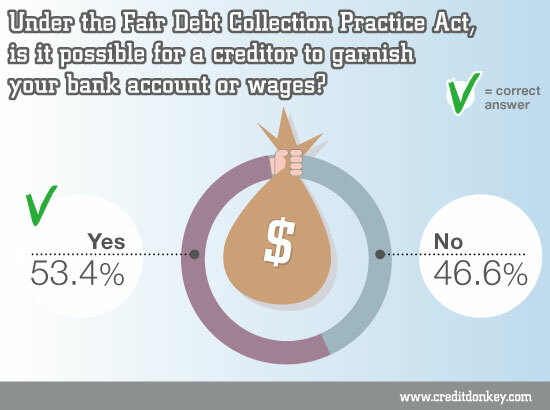 Only half of consumers, some 53%, know a creditor can garnish your bank account or wages. The fact is, in general, if you don't pay a debt, creditors can sue you to collect. If they win, the court will enter a judgment that allows the creditors to get a garnishment order against you. Such an order can direct your bank to turn over funds to pay the debt or your employer to withhold part of your compensation. To be sure, there are exemptions, including Social Security, veterans' benefits, civil service and federal retirement, and disability benefits. However, even those exemptions have exemptions. Delinquent taxes and overdue child support or student loans can be pulled from those benefits. 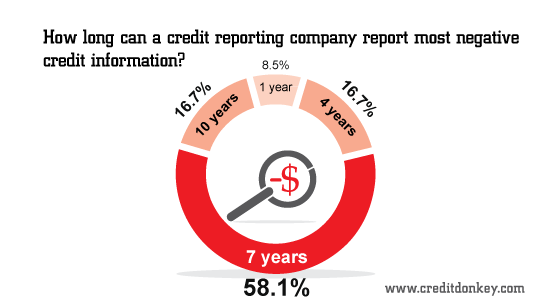 A quarter of respondents believe credit reporting companies can report the most negative credit information about a person for 1 or 4 years. In fact, credit reporting companies can report most types of derogatory information for 7 years and bankruptcy information for 10 years. Read our infographic on how to conduct a checkup of your credit health to learn how to protect your good name. 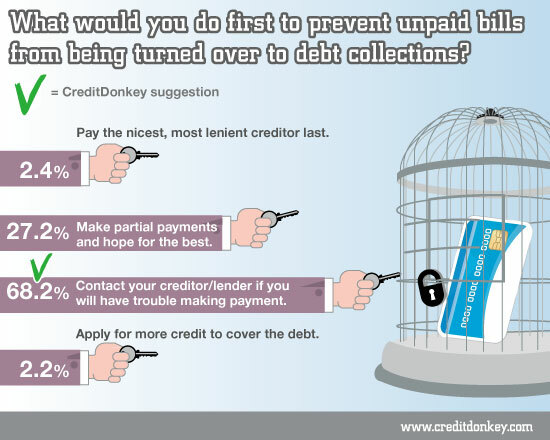 CreditDonkey helps make credit “donkey-proof” (easy to understand). This is part one of a two part survey. Read part two on how many consumers do not know their credit rights. Editor's Note: Numbers may not add to 100 due to rounding. Finding yourself deep in debt can be a discouraging reality. And in the past several years, more and more consumers have found themselves in this situation. Leave a comment about Survey: Credit Card Debt in America? Share on Facebook "Survey: Credit Card Debt in America"